Communication isn’t always easy to get right. Some of us seem to get it wrong even when we’re dealing with simple everyday tasks. So it’s no surprise to see people failing at it when they’re placed in the pressure-cooker of an intense game of football. When the adrenaline is flowing and your body is under physical and mental strain, communication can be one of the first things to go. In this post we’ll look at some simple, practical strategies you can use to make sure that you communicate effectively with your teammates – even when you’re in the heat of battle. If you’ve got something important to say and it can be said before the game, make sure you get your point across then, when it’s calm. In this state, you can think clearly about what you want to say and put your point across in a much more calm and effective way. The recipient can take time to let it sink in and ask any questions. It’s a much better method of communicating than trying to bark the same point to a teammate when they’re in the middle of a game. When the game is going on, adrenaline is flowing and there are lots of distractions, making it harder to get your point across. When players are intensely focused on the game, they can be harder to get through to than your Grandma when she isn’t wearing her hearing aid. 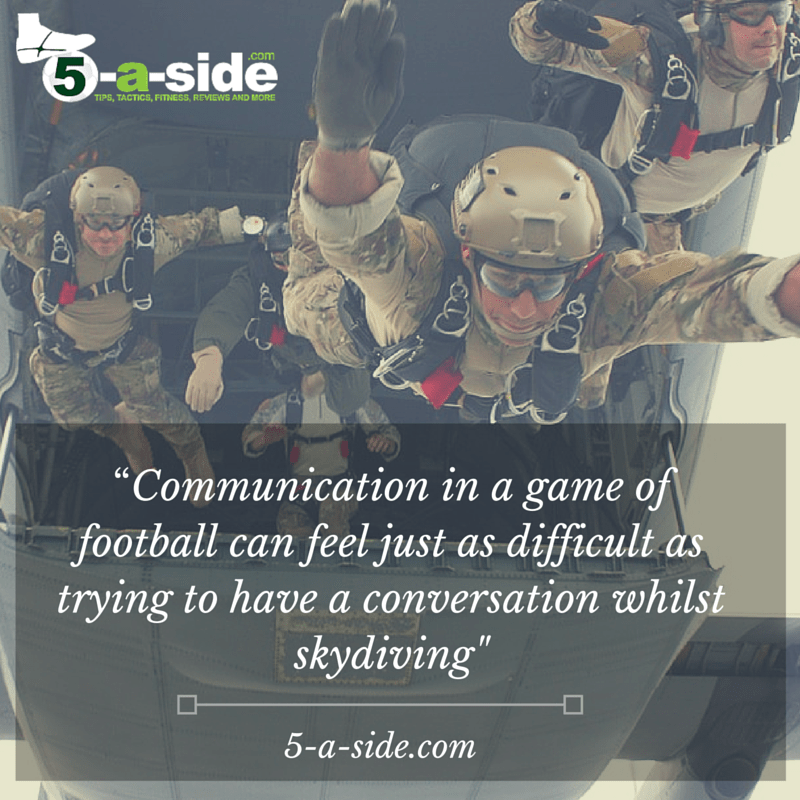 Think of it as like trying to have a conversation whilst you’re skydiving. People have got other things on their mind at that point and it’s difficult to get anything more than the most basic point across. In the midst of the game, your teammates have got so much to think about – how they’re positioned, how they’ll anticipate what happens next; where the opponents are; where their teammates are; whether they should change strategy – they’ve got little remaining capacity for other things. One thing that they definitely haven’t got time for, is trying to decipher your vague, poorly communicated ramblings. During the game, the things you say need to be SPECIFIC, they need to be USEFUL, and most of all they need to be SIMPLE. This wonderfully crafted plea really isn’t as helpful as it could be for a few reasons. Firstly, it’s not directed at anybody specifically, so it’s not clear who should be the one to sort it out. And second, it’s rather long, negative and panicked – the sort of thing you want to block out and pretend you didn’t hear. If it’s a fundamental problem with the entire team then this should be discussed thoroughly before or after the game. That’s a lot simpler, it’s makes it clear who you’re directing it at and how they can help. People will get on your nerves, and over time you may find that one or two players start to grate on you. It might be their attitude, their personality, style of play, or any number of other factors that’s winding you up. But too often these annoyances spill over into communication problems. You see people going absolutely ballistic over things that, had somebody else less annoying done it, wouldn’t have been an issue at all. That’s not saying that you can’t let anybody get on your nerves – that’s bound to happen from time to time. Instead, it’s about how you react. Being excessively harsh, unfair or aggressive in your communication with particular individuals reflects worse on you than it does on them. And it’s not solving the problem either. Try not to bottle your frustrations. Get them out in the open with that person in a calm and constructive way before or after the game, when everyone isn’t so fired up by the heat of battle. And if that doesn’t work maybe you need to start looking for other solutions – see what to do if 5-a-side isn’t fun any more. Another negative behaviour that often creeps in is constantly looking for somebody to pin problems on. For many of us it’s easier to go searching for scapegoats, rather than take a difficult look within. Avoid criticism, sarcasm, and sounding like you’re all-knowing or that you never make a mistake yourself. That’s simply not true, and you’ll only rub people up the wrong way like that. If you want the respect of your teammates, take responsibility for your own problems. Don’t try to pin them on somebody else, fix them yourself and become better through it. Don’t breed a culture where people shift responsibility to others like a lousy game of pass the parcel. I played in a league game a few years ago; it was a tight affair for a while. But after we’d defended brilliantly for a long time, our keeper managed to make a dreadful mistake. He somehow turned a very easy save into a complete comedy routine of a goal – almost literally throwing the ball into his own net. The rest of us all sank a little with disappointment but one of my teammates took it upon himself to point out to our keeper in an angry tone exactly how poor it was and why that made him a liability (I’m giving you the polite version here). Therapeutic though that might have been for my teammate, what purpose did it serve? Had he somehow not realised he wasn’t supposed to throw the goal in his own net? Of course not. Did he do it on purpose? No. Did he realise that he’d committed a clanger of a mistake and was his own morale already on the floor? Yes. Did that dressing-down suddenly mean that he was going to start catching the ball better in future? No, he was already trying his best. Actually, being spoken to like that dented the keeper’s confidence for the rest of the game. And afterwards he told me he wasn’t sure if he wanted to play any more, leaving me to pick up the pieces. Is it helpful if I say this? If the answer is no, keep it to yourself. When we’re stressed and frustrated and emotions are strong, we say things we don’t mean. We exaggerate problems and can be uncharacteristically aggressive. It’s at that point you need to be aware of your emotions and ask yourself the words you’re about to utter will actually help. Is it helpful if I say this NOW? If the answer is no, or ‘I don’t know’, don’t say it. You can always say it after the game. When you’ve calmed down and had chance to think, you’ll often think of a better way to put across your point, or even decide it doesn’t need saying at all. The art of communication isn’t just all about organising your team, pointing out problems and giving instructions. It’s also about building people up as well. The best communicators I’ve ever played with are the masters of this. They know when to sprinkle some praise on a player or the team, and they can take levels of performance up a notch just by delivering some encouragement at the right time. In my experience, nothing improves performance as quickly as sincere praise and encouragement. You can’t knock sir Alex’s record – he knew how to motivate players. I’ve seen it in my own experience as well. So many times I have seen players almost visibly grow with a little encouraging comment. Sometimes a bit of positivity is what you need to get the best out of players. The communication scale – where do you sit on it? There’s a communication model that was shared with me by Dr Matt Pain (twitter) – Sport Psychology Consultant at the English Football Association. Full credit goes to him for this excellent little tool. It’s a simple spectrum that illustrates the type of communication we tend to see within the game of football. It ranges from the supportive, right through to the downright derogatory (bringing back memories of that kid at school that everyone used to hate). The point is, if you can keep the tone of your communication toward the left of the spectrum, then you’ll be doing much more for the team than if you let it veer off to the right hand side. It’s also a handy reminder for each of us to think about where we are on the scale. There’s nothing wrong with all your communication being instructional (as long as it’s helpful and matches your team’s strategy), but you might get more out of your teammates if you can shift it towards the positives. Equally, you don’t want to overdo it with the positives – that can become distracting. In addition, using them all the time will lessen their effect, and also probably make your teammates question if you’ve been at the happy pills. It can be difficult for some people to receive feedback. If a person says something in a short, direct way, we can think that that person is being critical of us. A natural reaction in this situation can be to become defensive, even argumentative. Of course, that person might need to look at how they’re communicating their messages on the pitch. The chances are that they could be doing it more effectively, but it’s also possible that you’re being over-sensitive. In reality, there might not be anyting critical being said and you could be missing a useful piece of advice. Communication is a two-way street: you need to be able to give it as well as take it. If you’re often flying off the handle at comments directed your way, then it’s not necessarily others that are at fault. It could be you. Reacting like this certainly isn’t helping the team, and it’s probably not helping you as a player either. 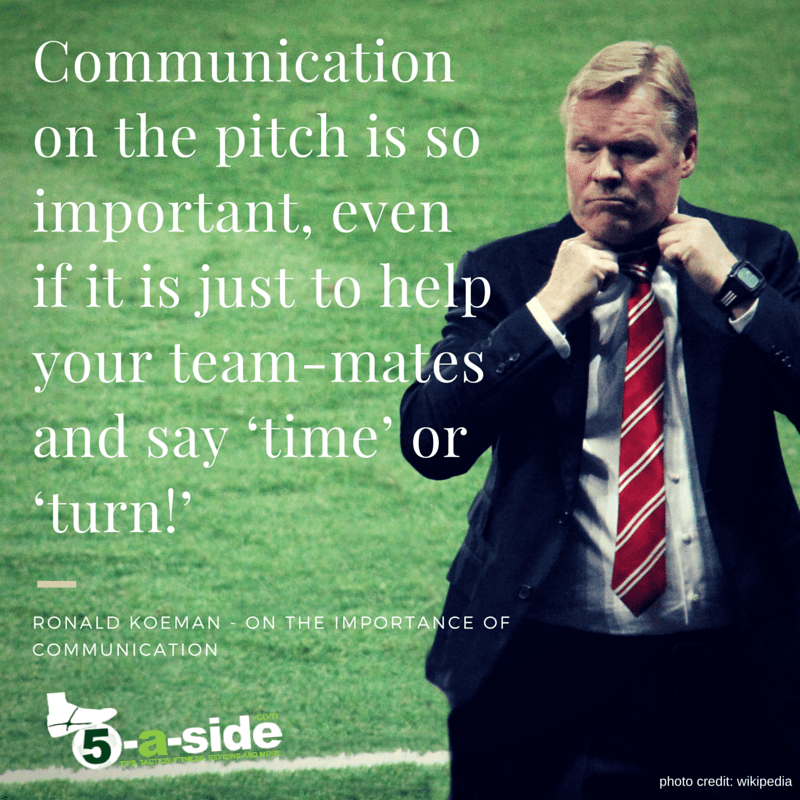 People often take communication for granted – they don’t ever stop to think about how they’re behaving on the pitch. That’s dangerous, because football can push us to the edge of our limits. We’ve all seen examples of people buckling under pressure and communicating poorly in that scenario. Good communication is a skill; one which can be developed over time. With a little effort and experience, you can improve the way that your team communicate with each other, which will help your team spirit grow. 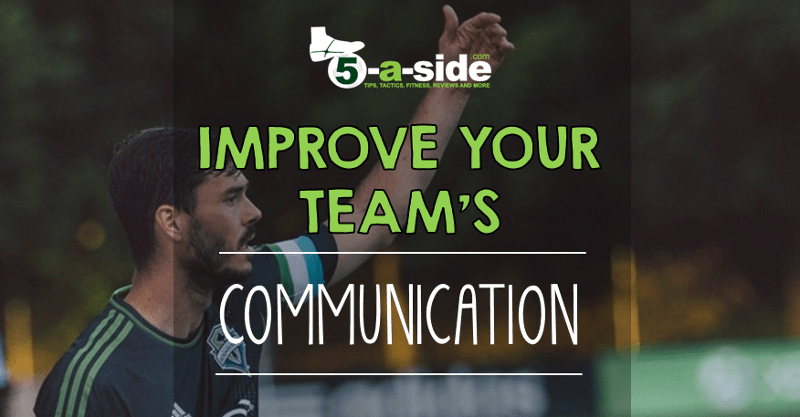 Ultimately, communication is an important factor in making you a better player, and making your team much more effective on the pitch, so it’s worth getting it right. Read more: We recommend reading our Communication Tips for Effective Coaches and Teams. Written by professional sports psychologists, here are 8 things to consider when you’re trying to get the best out of a group of players, whether you’re doing that as a coach or a player. Note: Dr Matt Pain has not been consulted in the preparation of this article and we do not claim to represent his views. We’ve simply referenced a model that he provided. If you want to hear Matt’s own views on all aspects of sports psychology, give him a follow on twitter. Love that comment Darryl. 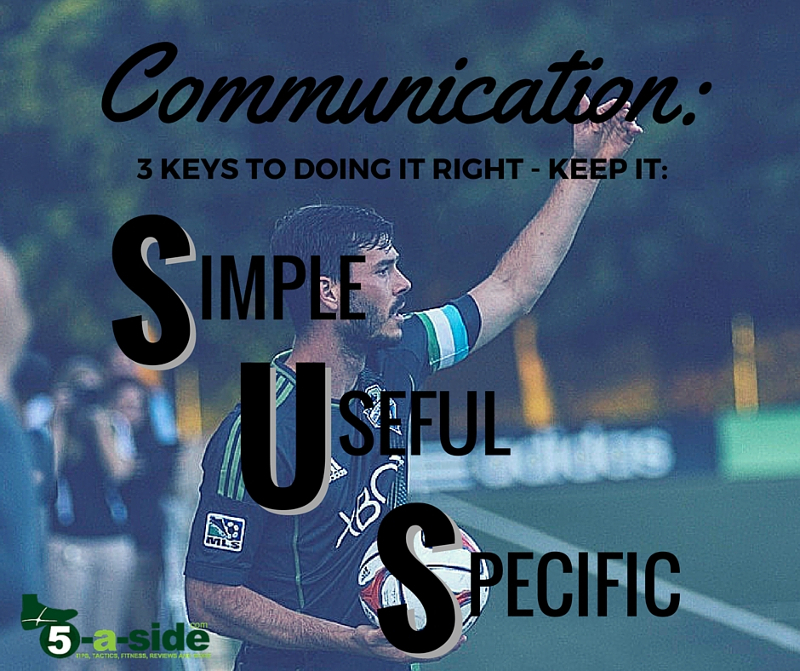 For me, I’d like to think that everyone can attain a basic level of communication that can be useful to the team. But I think it’s something that is so fundamentally overlooked that there are people out there who think that normal communication is just to have a go and look for scapegoats. I think it’s a cultural issue. I’m a believer in trying to lift players and teams out of this mindset and to try to get people to bear responsibility for things, and to see the impact their communication can have on the team. It might be a hopeless task but in the interest of trying to enjoy my football when I play, it’s one I’m willing to give a go. 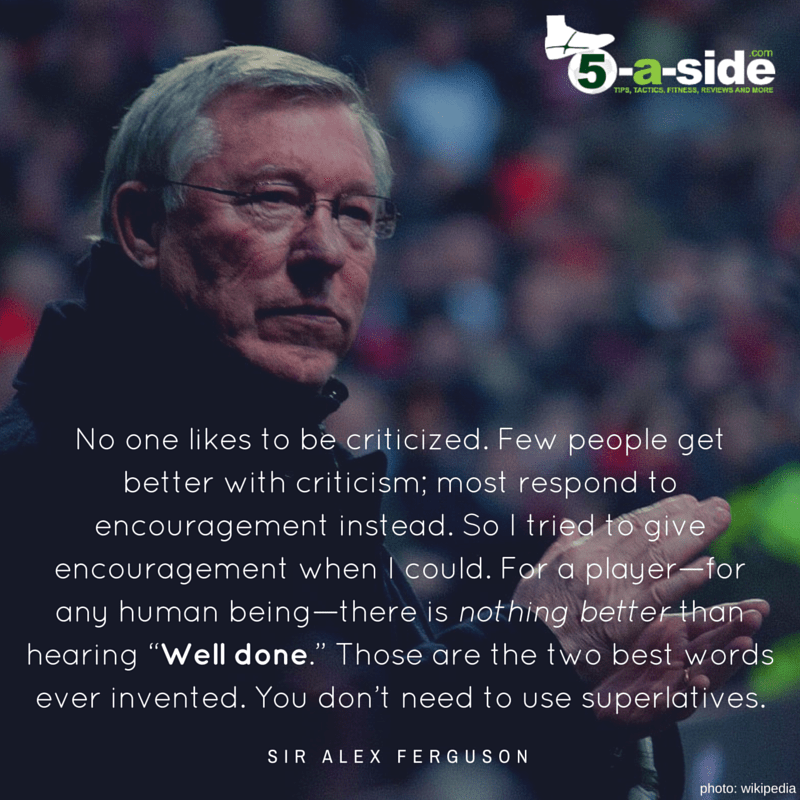 Love the quote from Alex Ferguson. That’s key to me. Communication needs to be kept positive otherwise I have found that it quickly spirals into a negative situation. Thanks for the comment, Adam. I’m with you there, I’ve seen negativity infest the spirit of the team too many times.